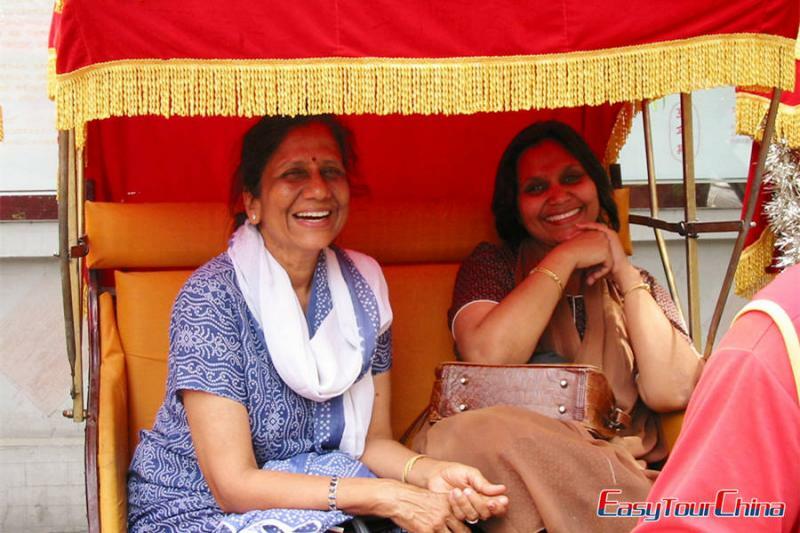 Tiananmen is a national symbol of modern China, which literally means “Gate of Heavenly Peace”. 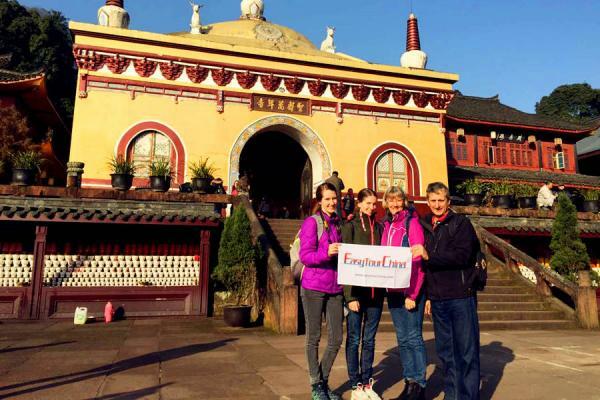 It was first built during the Ming Dynasty, served as the gatehouse – the entrance to the Imperial City. 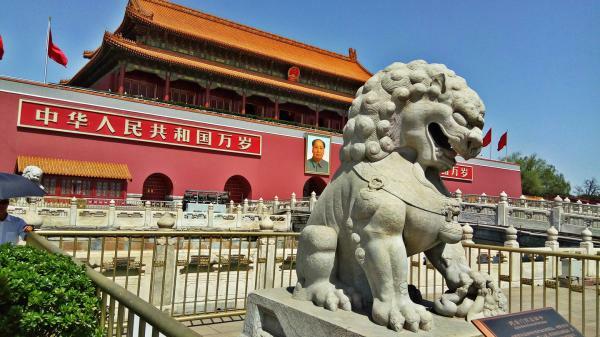 The building is located in the central axis of Beijing, south end of the Forbidden City, and the northern edge of Tiananmen Square, separated from the Tiananmen Square, Monument to the People’s Heroes, Chairman Mao Memorial Hall, Great Hall of the People and National Museum of China by the Chang’an Avenue. It is 66 meters long, 37 meters wide and 32 meters high, and made up of a platform and a tower. Under the platform, there are five archways. The largest of the five is right at the center. In history, the central archway is specifically used for Ming and Qing emperors passing through, while the side smaller ones are used as the passages for ministers and officials. Above the largest archway hang a big portrait of chairman Maozedong and two large placards on both sides of it. One reading: “Long Live the People’s Republic of China”. The other one reading: “Long Live the Great Unity of the World’s Peoples”. Like other official classical architecture, the whole building has unique imperial roof decorations – large overhanging eaves. 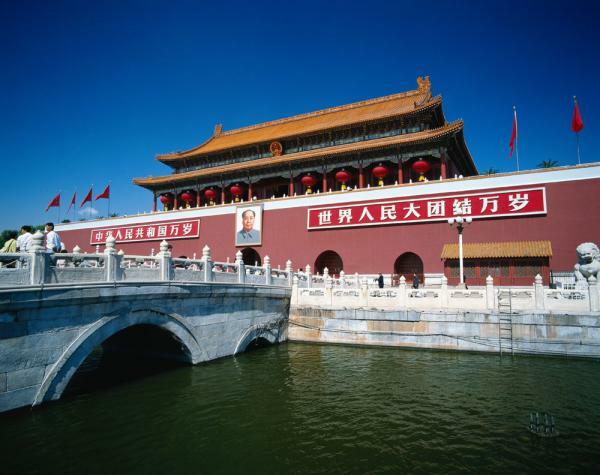 In front of the Tiananmen Tower, there are 5 beautiful white arch-type marble bridges - golden water bridges. Like the arch gateways, the central bridge is the widest one, which was served only for the emperor. 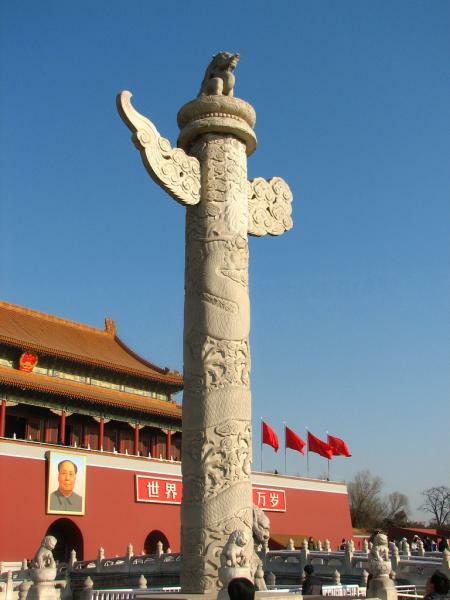 Two stone columns, carved with dragon design, called Huabiao standing in front of the Tiananmen Tower, and each of them has a stone animal on top as decoration, one is called “Wangtianhou”, and the other one is called “Wangjungui”. Originally, they were used for the common people to present a petition by writing on the columns, but now, the Huabiao become purely decoration and a kind of demonstration of royal majesty. Outside the gate, two pair of stone lions sitting there. One pair is guarding the gate, and the other pair is guarding the bridges. In Chinese culture, lions are believed to be a mascot, which can protect humans from evil spirits. They are elaborately carved with a whole stone and so lifelike. You can enjoy the artistic carving technics of Ming Dynasty. 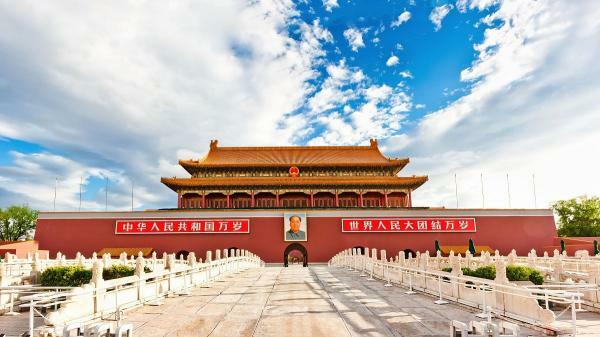 Tiananmen Square is the largest city square in the world. It can accommodate a million people to hold a large rally. 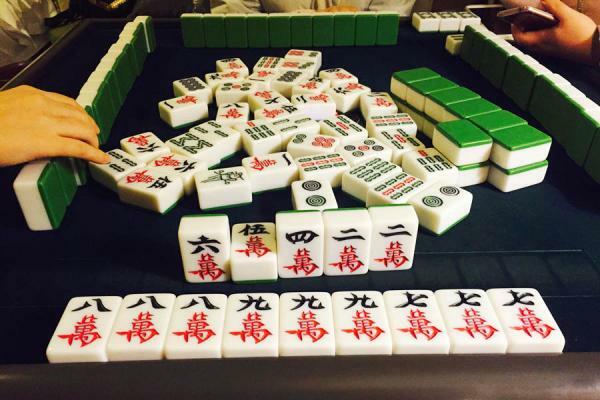 It recorded the revolution of the Chinese people’s indomitable spirit and fearless heroism. There are many important political events occurred here. So to speak, Tiananmen Square is the witness of China from fading to rise of history. You can get here by bus or subway, and get off at Tiananmen West or Tiananmen East. 1.Before visiting the Tiananmen Square, you will need to pass through a security checkpoint, including being asked for identification. So you should better bring your passport with you at all time. 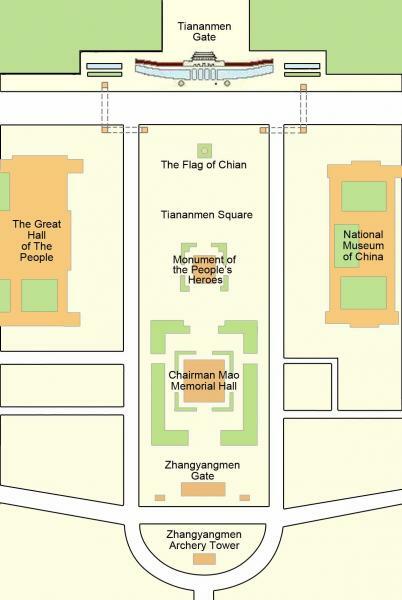 2.Take a close look at the official notice to Tiananmen visitors. 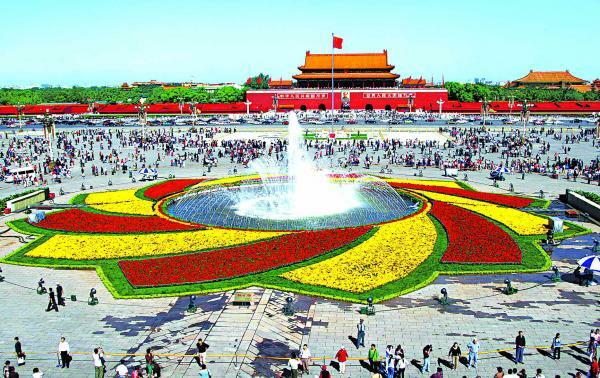 3.If you want to go up to visit the Tiananmen Tower, bags are not allowed. And the bag storage service is provided. 4.Avoid wearing clothes which printed with political or religion themes or information, like “Free Taiwan” shirts.